1. 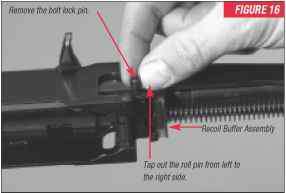 Before reinstalling the trigger group, make sure that the bolt is fully forward and engaged in the locked position. 2. Visually check the safety on the trigger guard to make certain it is still in the "on safe" position. 3. Insert the trigger group back into the receiver, lining up the holes in the trigger group with the holes on each side of the receiver. 4. Insert the trigger group pins from either side of the receiver and gently tap them into place using care not to scratch the receiver. 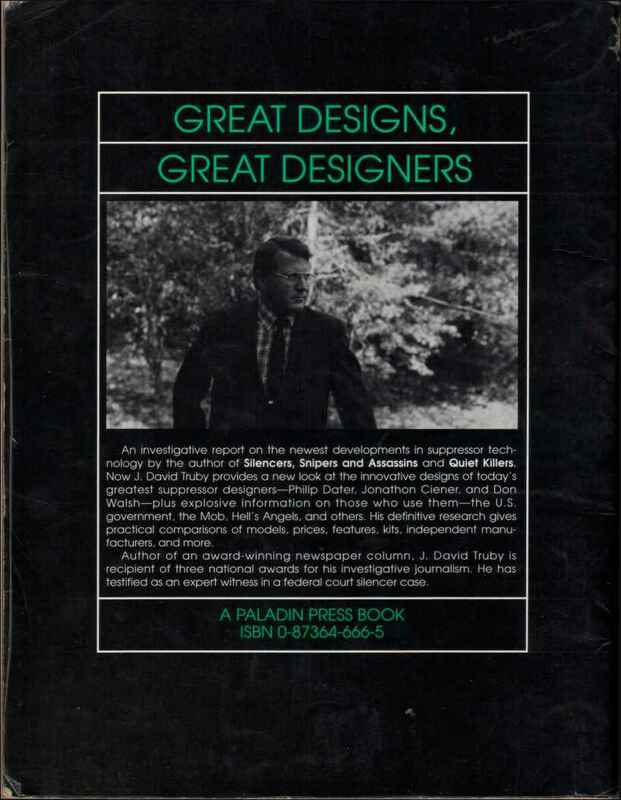 NEVER ATTEMPT TO TAKE YOUR RIFLE APART FURTHER THAN EXPLAINED IN THIS OWNER'S MANUAL. to disassemble the inner mechanism assemblies. Be sure to use eye protection whenever disassembling and reassembling your rifle due to the presence of spring-tension parts. If further disassembly for service or cleaning is required, take your gun to a Winchester Rifles and Shotguns Authorized Repair Center or a qualified gunsmith, or send it to our Arnold, Missouri, service facility as explained under "Parts, Service, Repair and Questions" on page 23. 1. BE CERTAIN THE RIFLE IS COMPLETEL Y UNLOADED AND THE SAFETY IS IN THE "ON SAFE" POSITION. Again, to unload your rifle, remove the magazine and eject any live cartridge in the chamber by pulling the operating handle to the rear. 2. Release the bolt to its forward position. 3. Use a 9mm wrench (shown) or pass a small instrument, such as a screwdriver or punch, through the sling swivel stud eyelet on the forearm (Figure 12) to remove the sling swivel. Taking care not to scratch the forearm, turn the sling swivel in a counterclockwise direction. 4. Pass a small instrument, such as a screwdriver or punch, through one of the holes in the forearm attachment nut (Figure 13), taking care not to scratch the forearm, turn the forearm attachment nut in a counterclockwise direction. The forearm attachment nut is captive and non-removable. Approximately 10 half-turns will loosen the nut so you can remove the forearm. 5. Firmly grasp the forearm and slide it forward and off the rifle. 6. Remove the action bars while the bolt is still closed. To remove the left action bar (the side opposite the bolt handle), pull the forward end away from its slot on the inertia block. Lower and pull the action bar forward and out of the receiver (Figure 14). Remove the right action bar by first removing the bolt lock spring from the bolt lock using a flathead screwdriver (Figure 15). 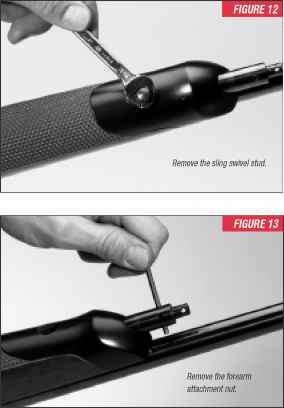 Remove the bolt lock pin (Figure 16) and pull the bolt lock forward and out of the receiver. You can then pull the forward end of the right action bar away from the inertia block, and lower and pull the action bar out of the receiver. 7. With a small punch, gently tap out the roll pin located just forward of the bolt lock pin. NOTICE: The roll pin must be tapped out from the left to the right side. 8. Grasp the action spring securely and compress it forward enough to expose the action spring guide. 9. 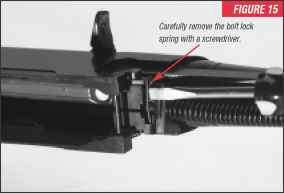 While maintaining tension on the action spring, slide the action spring guide forward slightly and remove the recoil buffer assembly. 10. Continue to maintain tension on the action spring and slide the action spring guide fully rearward. 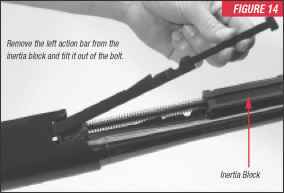 The action spring and action spring guide assembly can now be removed, along with the inertia block and gas piston, by pulling the action spring down and away from the barrel (Figure 17). Remove the assembly slowly as the action spring is under tension and care should be used to avoid injury and lost mechanical parts. NOTE: The gas piston must be inside the gas cylinder in order to remove the action spring guide. making sure the larger holes on the end of the two pieces are in alignment. 12. Remove the piston by pulling it rearward out of the gas cylinder. The gas cylinder can now be examined for accumulations of residue. Residues in the gas cylinder and on the gas piston should be thoroughly removed with a good quality powder solvent or bore cleaner. If residues are heavy, remove them by scrubbing the gas cylinder with a 20 gauge shotgun bronze wire bore brush and a good powder solvent. 13. The gas piston, gas cylinder, and other parts covered by the forearm should be wiped with a lightly oiled cloth after cleaning. The gas cylinder interior and the gas piston should not be oiled beyond this. Remove the action spring, action spring guide and inertia block assembly. How to remove action slide on mossberg? Does anyone know how to disassemble the trigger group on a winchester mod 12?